Tale as Old as Time: Guests are invited to be a part of the story at Enchanted Tales with Belle in Fantasyland at Magic Kingdom Park. Guests are transported through an enchanted mirror to Beast’s castle. They’re just in time to help Lumiere and Madame Wardrobe host a very special surprise for Belle. The audience gets to play various characters from the film to re-tell the story of how Belle and Beast met just before she has dinner with Beast. Song as old as Rhyme: Guests can also interact with the story and the music from “Beauty and the Beast” with several entertainment options at both Disney’s Hollywood Studios and Magic Kingdom Park. Beauty and the Beast – Live on Stage! 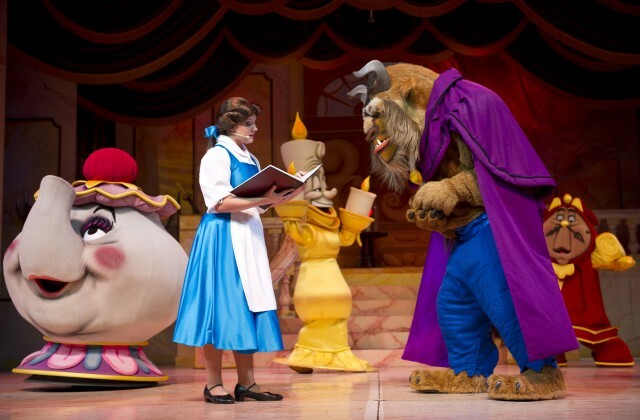 immerses guests in a Broadway-style show where Belle, Gaston, Beast, Mrs. Potts and other characters perform songs and scenes from the classic film. The 25-minute performance takes place daily at the Theater of the Stars. A sneak peek of the upcoming live-action film is screening at the theater inside of the Walt Disney: One Man’s Dream attraction now through March 26. Guests also can see Belle’s iconic yellow ball gown and the Enchanted Rose from the live-action film in a gallery exhibit inside the attraction. 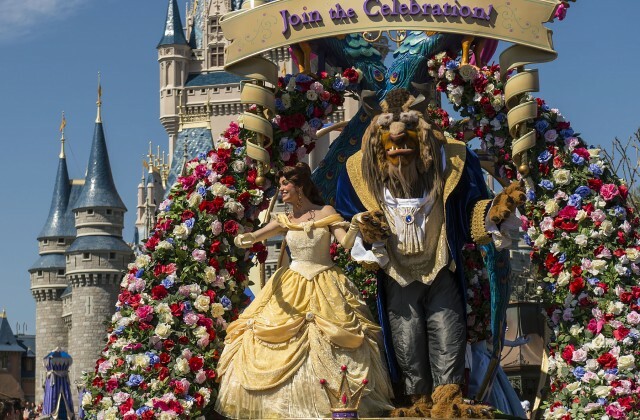 Belle and Beast lead off the Disney Festival of Fantasy Parade as it loops from Frontierland to Main Street, U.S.A. This sight-and-sound spectacular celebrates the magic of Fantasyland with several Disney friends and colorful floats. Parade kick off is 3 p.m. daily. Put Our Service to the Test: Soup du jour, hot hors d’oeuvres, Walt Disney World restaurants only live to serve. Guests can find several “Beauty and the Beast” dining opportunities throughout the theme parks and Disney Springs. Be Our Guest Restaurant: This one-of-a-kind dining experience can be found inside Beast’s castle in Fantasyland at Magic Kingdom Park. 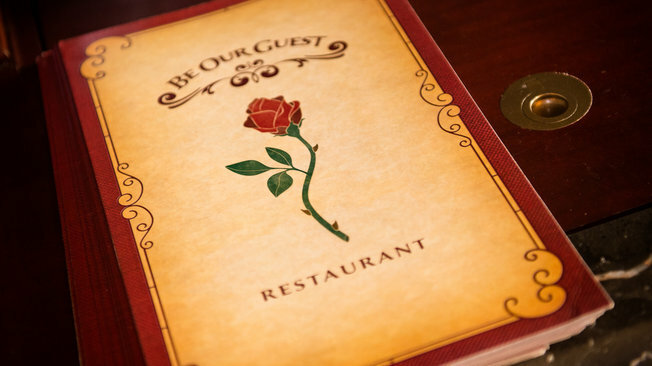 Be Our Guest brings the story of “Beauty and the Beast” to life with atmospheric and culinary delights. It features an elegant ballroom, a Rose Gallery and the infamous West Wing for diners, with snowy views of the French countryside. Guests can even try the Grey Stuff, which is sure to be delicious. Beast, the master of the castle, meets with diners in his study after their meal. The French-style restaurant serves quick-service breakfast and lunch, and full-service dining for dinner. Gaston’s Tavern: This French-style lodge is decorated with hunting trophies and other keepsakes dedicated to Gaston. Guests can sit in his fireside chair, complete with signature antler décor, and sip on LeFou’s brew, a frozen apple juice beverage infused with a hint of toasted marshmallow and topped with mango foam. The Tavern, located in Fantasyland at Magic Kingdom Park, also serves a variety of pastries, including the signature giant cinnamon roll. The strapping Gaston himself can be found meeting adoring fans outside the Tavern as well. Akershus Royal Banquet Hall: Guests can dine with several Disney Princesses, including Belle, in the Norway Pavilion at Epcot. Guests of all ages can visit for breakfast, lunch or dinner in this medieval castle setting, mingling with the princesses who pose for photos and sign autographs. Guests also can find unique pastries inspired by the Beauty and the Beast story at several locations, including the Enchanted Rose cake at Amorette’s Patisserie at Disney Springs and a Belle-inspired vanilla cupcake at Main Street Confectionary at Magic Kingdom Park. A Beauty but a Funny Girl: Belle meets her fans in the France Pavilion at Epcot. 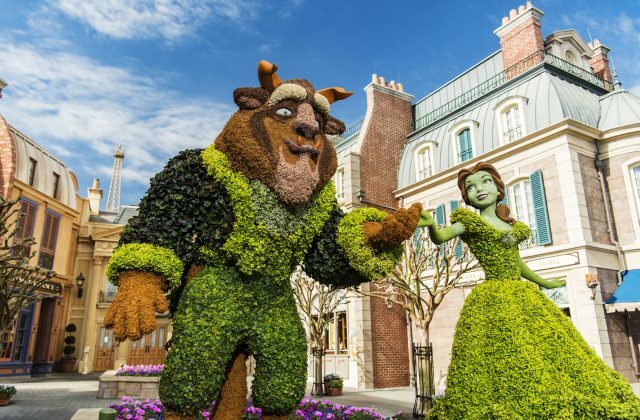 Topiaries in France shaped like Belle, Beast and other “Beauty and the Beast” characters are showcased during the International Flower and Garden Festival, which runs now until May 29. Royal Treatment: Little princesses also can get the royal Belle treatment at Bibbidi Bobbidi Boutique, located at both Disney Springs and inside Cinderella Castle at Magic Kingdom Park. Fairy Godmothers-in-Training transform young guests with princess costumes, hairstyles, nails and more. Happily Ever After: For brides-to-be, there are endless ways to include “Beauty and the Beast”-inspired touches to their big day thanks to Disney’s Fairy Tale Weddings & Honeymoons. Brides can customize everything from their wedding décor to the menu to wearing a Belle-inspired gown. Will you be enjoying some of these experiences? Please leave a comment!